I wrote about pancakes, here, last year. That post is extremely popular, with lookie loos because, it seems, the picture I used is very appetizing. Today, I thought I would give them something else to look at. Pancakes, not as beautifully perfect, but mine nonetheless. 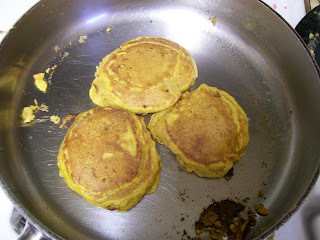 This morning, I decided to make pumpkin pancakes. They turned out very good! :) I also made caramelized bananas to go on top. Yum! Now I would like to know, do you like pancakes? If so, do you have a special type you like to eat? I think you know my love of pancakes. When it comes to how I eat them, I'm a no-frills guy. Have you ever tried Alaga syrup? That's the brand that I grew up eating; I bought a bottle about a month ago because it had been years since I'd had it... yum! It's funny that you wrote this post because I started my own pancake post about a week ago. 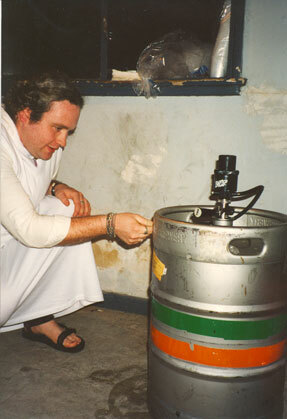 Hopefully, I'll have it finished before 2009. I like food and am not picky. I think just about everything is good! I loves me some pancakes( and MAN, do those carmelized bananas look good!!!!!) and my all time favorites are probably the far too sweet(but fantastically delicious) chocolate chip pancakes at IHOP. yummy! I like plain ol pancakes, with plain butter, and plain maple syrup! Now I am hungry! Thanks Jessica! YummY, that looks delicious. Actually, Ty eats pancakes every morning for breakfast. Since he has so many allergies, we make a months worth in advance and freeze. The batter is a brown rice & tapioca flour made by Namaste foods (no sugar, no gluten, soy, dairy, corn, potato) Each morning I pop two in the toaster and top them with sunflower seed butter rather than syrup for more nutrition. I even mix vitamins right in the nut butter and he has no clue he is getting many of his vitamins for the day! 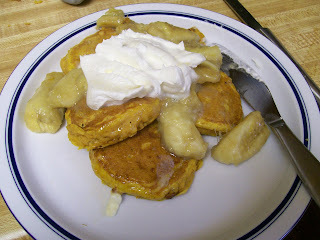 Love the look and sound of pumpkin pancakes - I didn't even know they existed...I'll have to try them out - thanks for sharing..! pancakes are next to godliness, or so I've been told! Oh my goodness, Jessica, those look yummy! I have never tried Alaga syrup, but now that you've recommend it, I will! When I was little, chocolate chip pancakes, were all that I would order at Ihop! :)Yum! Cool--I'm glad he likes them, and that you can sneak extra vitamins in! :)Sunflower seed butter, that sounds really good! Aw, thanks. :) Right back at you! haha, yes, I believe you're right! :)mmm, now I'm thinking about blueberry pancakes! Looks delicious!! My fave, which I do about once a month for me and J are blueberry pancakes. So yummy. My next pancake adventure is going to be something I saw on Cooking For Real: Peanut Butter Pancakes with fresh Blackberry Syrup! YES, I love pancakes. In fact I had them for lunch last Saturday at Denny's. I like blueberry or just plain buttermilk pancakes but with fruit topping and whip cream is always nice too. Or syrup, especially raspberry or blueberry. As you can see, I'm not very picky when it comes to pancakes.